Hello, my name is Colbey and I have a confession...I have a lot of hobbies. Most of these hobbies don't always cross over into my other hobbies, but this is one time where toys I collected yielded baseball cards. Many know of the great guy behind the Nachos Grande blog and his love of all things Allen & Ginter. Another passion of his is LEGO. He's been trying to complete the various blind packaged Minifigure Collections and recently I was able to help supply him with several figures from his want list. In turn he graciously went through my A&G want lists and sent me a nice selection of cards. I didn't know what he was sending over. I really didn't care. I was just glad to get the Minifigures into the hands of someone who will appreciate them. I've been downsizing (yet again) my toy collection and most of the figures I sent off I had no intentions of keeping. In exchange I was able to put a huge dent into both my 2016 and 2017 A&G want lists. Thank you so much for the trade! I wasn't able to afford a hobby box of Ginter this year so I really appreciate all of the 2017 cards. This puts me ever so closer to finishing off at least the base set for these two years. Now that I'm getting to sorting through these monster boxes that have been stacked in the corner of my office for some time, I'm coming across cards that I no longer wish to hold onto. I've tried selling low value cards in my eBay store and frankly it just isn't worth my time to list these, so I've decided to just give them away! I'll cover the postage for 1-3 cards. For sets I would ask if you would help cover the shipping, I'd appreciate that. I really just want to put these into the hands of others that will enjoy them, otherwise they may end up keeping me warm this winter! To claim a card or a lot, just leave a comment letting me know what you want. Then simply send me an email (flywheels at yahoo.com) with your name, address and what you wanted and I'll reply w/ my info. To keep this fair, I'm going to limit this to two (2) cards or lots per person per week. I have a good bit I plan on letting go so if you don't see anything that interests you this round, stay tuned as there will be more to come. I've even got some hand collated sets that will be up for grabs. Unfortunately the cards aren't in number order and honestly I didn't want to spend the time to put them in order, so I really can't tell you how many cards there are, or what cards are missing from the set. However as you can see the cards nearly fill the entire long box. The age old question of how card collectors organize/display their cards will usually yield a myriad of different answers. Some people prefer to put their cards in penny sleeves and top loaders and then toss them in some sort of shoe box or monster box. Others will put them in 9 pocket pages and inside a binder. Others simply put a rubber band around their stack(s) of cards. For me I prefer to use 9 pocket pages and binders for certain sets. If it's a set I plan on building most of the time it'll end up in pages inside a binder large enough to hold several years of that set. However when it comes to smaller sets I've been putting them in one of my shoe boxes inside my card house. Some of my non-sport sets that ideal for being in pages, but I only have so much room on my book shelf for bulky d-ring bingers. A few months ago I noticed that Target had started to carry a soft binder in their trading card section called Card Guard. For $12.99 I thought I'd give it a try. I bought the only black one I could find. It was also offered in red, blue, green and yellow...at least those are the colors I saw when I made my purchase. This card folio is made by BCW and offers 20 pages. The cards load from the side versus from the top like a traditional 9 pocket page. The back of the page is black and has small raised dots, similar to the look/feel of a basketball. The pages seem sturdy including the pocket welds. My first impression of the card folio was "this is different...I kinda like it". I immediately thought it may be good for certain card sets, or to carry with me when I travel for work. It seemed to be sturdy overall and the elastic strap keeps the folio tightly closed. Above you can see I started to fill up the folio with my Star Wars Rogue One set. I don't normally put cards back to back in pages, but seeing how these pages are designed to do so I filled it up. Being that you can't see the back of the card may be a deal breaker for some, but it doesn't bother me too much. I did figure it'll be more of a pain as I acquire more cards for this set as I can't easily see the card numbers on the back. I can see this folio appealing to collectible trading card game players perhaps more than sports card collectors. What do you think? Overall I'm impressed by it's overall quality. The cards are staying put, are easy to put in the pages and the strap keeps everything fairly tight and together. I've taken it with me on a few business trips and it's come in handy. I've bought a pack of cards as I could make sure they cards would be safe inside the pages as opposed to tossing the packs into my suitcase. I don't know if I'll pick up any more, but the one I have I'm finding very useful. 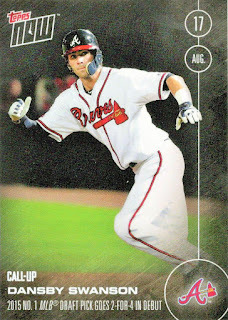 Nearly one year ago, Dansby was called up by the Braves from AA. 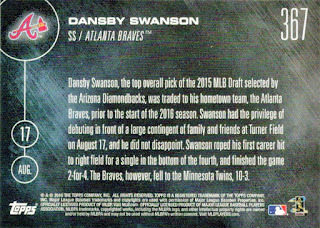 There was a lot of fan fare made about him when the Braves orchastrated a trade w/ the Arizona Diamondbacks before the start of the 2016 season. I'm still in awe of this lopsided trade that eventually led to the firing of the Diamondback's General Manager. 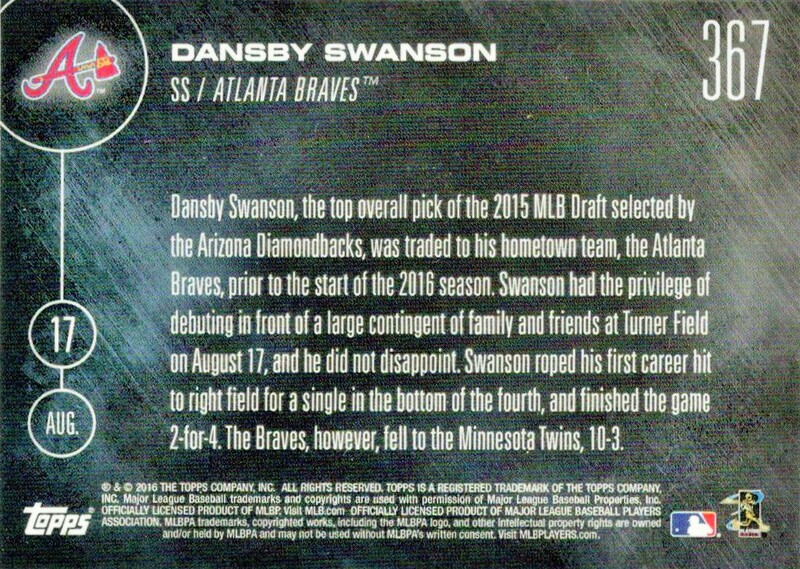 When Dansby was sent down to AAA Gwinnett many thought it would be for the rest of the season, but on August 17, 2016 he would go 2-4 in his big league debut. While he does seem rejunvenized since returning from AAA, I'm really looking forward to the 2018 season as the Braves have a lot of great young talent that is just waiting to show the rest of major league baseball what they can do.